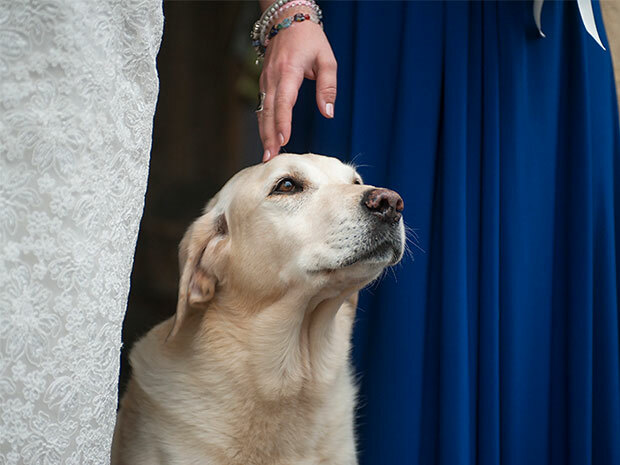 Following a proposal on the slopes, Mathew and Harriet tied the knot in the Cotswolds, celebrating with a country theme and beautiful setting thanks to Bisley Marquees – and their dog played an important role in the nuptials! 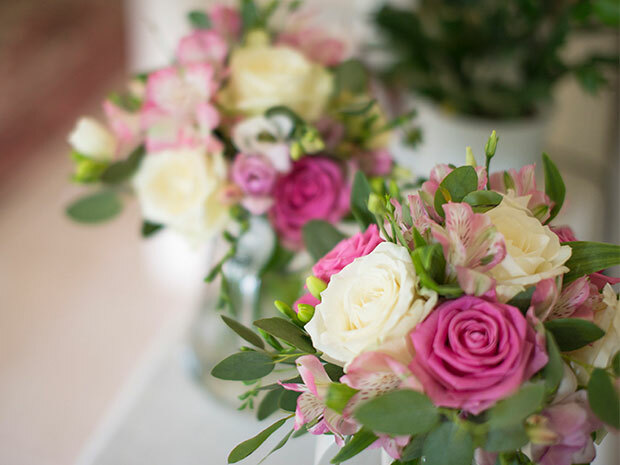 Wedding theme: Country wedding with a hint of shooting! Groom’s outfit: The tails were from R Scott & Co.
We met on Exmoor (where our family live), at a tea party. It wasn’t where either of us expected to meet! Mathew; he popped the question skiing on a red run in the Pyrenees! 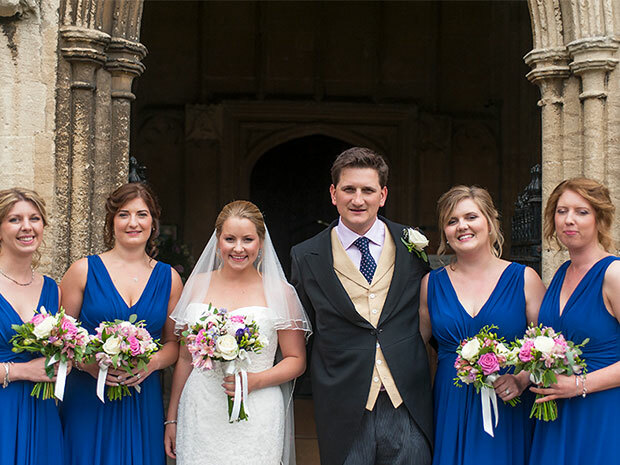 We live in Fairford and wanted a church wedding. Our friends kindly let us use their field for the marquee. 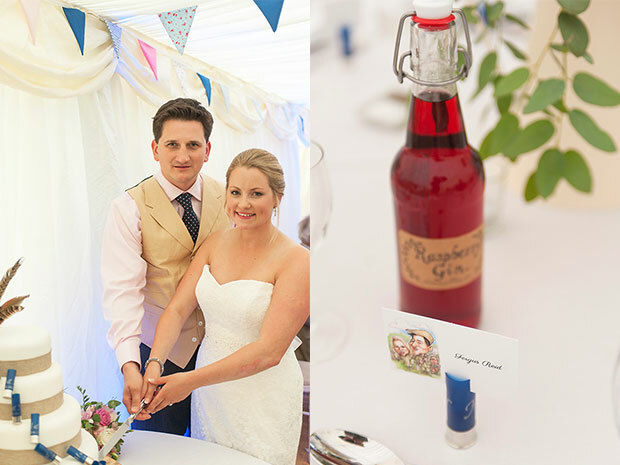 We really wanted a marquee as we love decorating and organising! As Mathew works in shooting and we both like the outdoors, we had a country/shooting theme. For example, cartridge place settings, feathers in our flowers, feathers in button holes. The colour scheme was pink and blue! Mathew knows him through work! 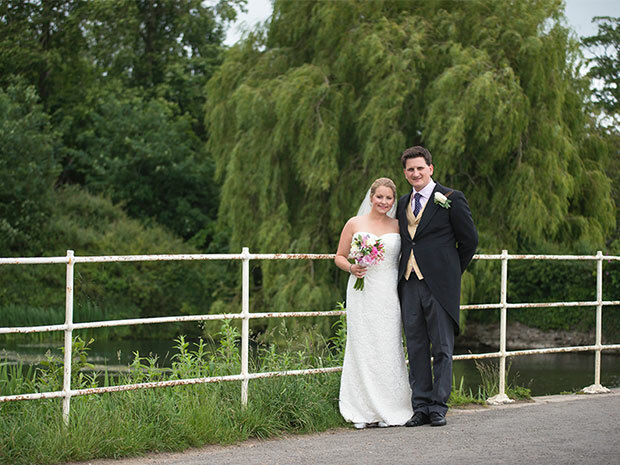 We had lots of photos whilst getting ready, outside our house and outside the church. To make it more special we have lots of photos of our little girl, Phoebe, who was only five months at the time! DIY – whilst on maternity leave! I made 100 metres of bunting to decorate the marquee with, we dried the confetti and made the confetti cones! We decorated the bar with handmade pom-poms. It was very simple, lace with a sweetheart neckline, beautiful buttons up the back and finished with a sparkly belt! The tails were from R Scott & Co. in Cirencester, and the pink shirt and polka dot tie were from Oliver Brown. Yes. Old – earrings, new – dress, borrowed – headpiece, and blue – my engagement ring! Yes, by close family and friends. A selection of canapes, shoulder of lamb, and pavlova with fruit. Simple, but decorated with cartridges that we had made especially for our wedding! Walk the Moon’s ‘Shut Up and Dance’. 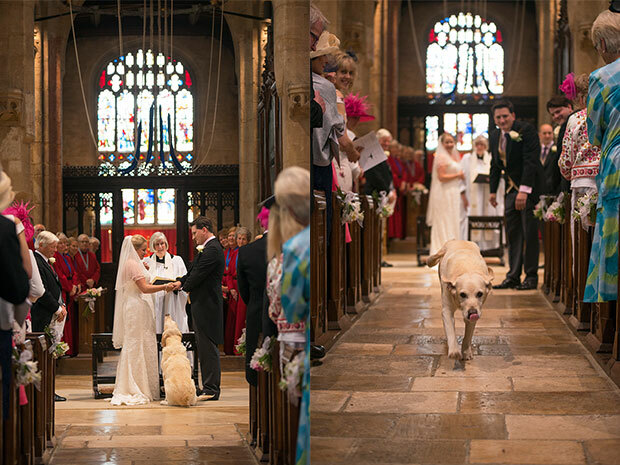 That’s hard to say – a magical moment was when our Labrador Bruce went down to the back of the church to retrieve the rings! Organisation is key. Do as much prep before the day as you can. You don’t want to be stressing about details the day before, you want to enjoy the build up with your close friends and family! In hindsight we wish we had a video! Menorca, with our five-month-old baby. We will do a proper honeymoon at some point, just the two of us! 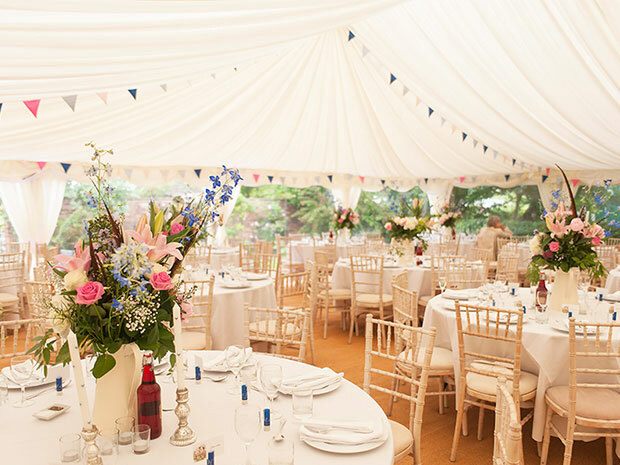 If Mathew and Harriet’s wedding has inspired you, see Bisley Marquees, call (01452) 770613, email info@bisleyhire.co.uk, or visit bisleyhire.co.uk directly.